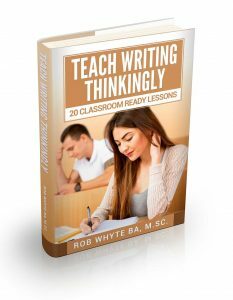 Sometimes an EFL class needs activities which get away from the textbook in order to keep everyone motivated, including the teacher. 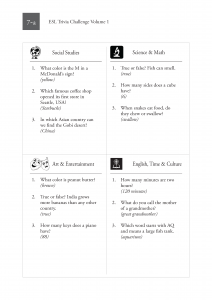 Here are three activities that work well with pairs or small groups. 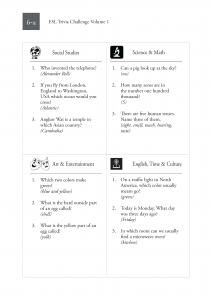 These EFL conversation activities help students learn English by involving a number different language skills including task-based problem solving, fluency, intensive listening and precise vocabulary. 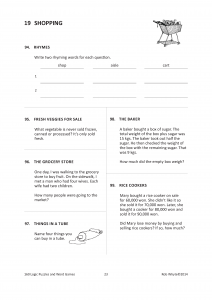 This fun exercise that will challenge your intermediate+ level EFL students. Watch a short video which contains 13 segments (the video is about one minute long). Each segment shows dots and lines moving in way that visually illustrates an abstract concept. Now describe each segment with precision. Sounds easy? Ha. Break students into pairs. Finishing 13 segments takes too much time (and is impossible to complete in one 50-minute period), so I usually divide the class in half. Group A students do the first 6 segments. Group B does the last six. Describe in specific detail the movement of the lines and dots. Don’t be vague. Do you think the movement accurately represents the concept? Asking students to evaluate the artists’ representations turned out, in my case at least, to be quite interesting. The students often had very different ideas and reflected values that I had never considered before. If time permits, consider jigsawing the groups and ask each student to explain their definitions. Otherwise, save ten minutes at the end the class for a wrap up of all the descriptions. If time permits, ask students to write descriptions of 2 to 4 segments and include their own analyses. A challenging though worthwhile writing assignment indeed. 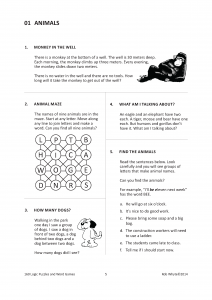 Logic puzzles and word games are a great way to focus student attention on reading comprehension and problem solving. Most puzzles range from easy to challenging with a couple of tough ones for the smart kids. Copy sheets for class – usually one page per pair of students. If time is short, I display one set of questions on the classroom projection screen. Break students into pairs. The challenge is not just to solve the problems, but to explain the answers. If there is extra time, I jigsaw the students and ask them to describe the problems and explain the answers to their new partners. 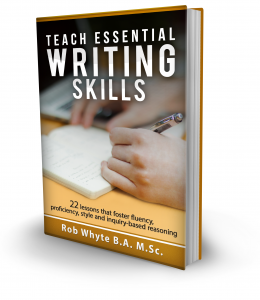 If you like these activities, consider buying the ebook. 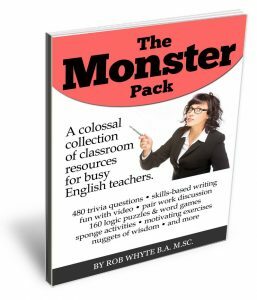 All of these worksheets – along with teacher notes and answer keys – come from my ebook the Monster Pack. 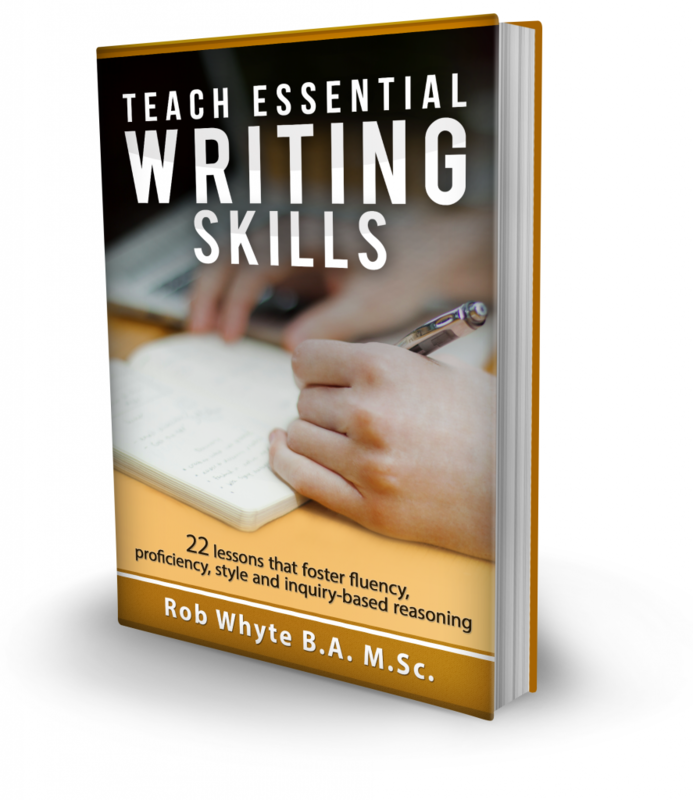 Click here to get detail about this 240-page resource and buy online with immediate download. I usually run a trivia game in my conversation classes twice per semester, usually the last day of class before midterm and final exams after completing the review. My students love this activity because they enjoy the good-natured competitive aspect of the game. I love it because the students are fully engaged in using English while asking or listening to the questions and answers. Finding trivia questions suitable for EFL students was difficult. 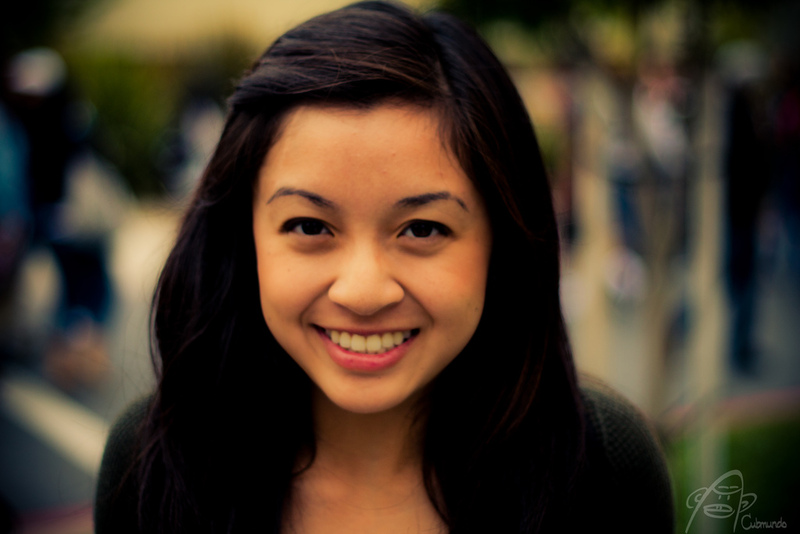 The web has lots of questions but it requires some familiarity with American culture. So I created my own questions – 480 general knowledge questions about science, math, social studies, art, entertainment, English and culture. Move the desks around and sit four people per group. Two people on a team playing against one other team seems to work best for my students. In this format every student is playing at the same time, which helps maximize learning for the class as a whole. There are three levels of questions. Level 1 to 3, from easy to hard. Answer a Level 1 question correctly and you get 1 point. Get a Level 3 question right and you get 3 points. 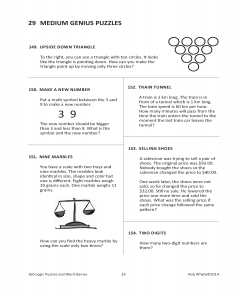 Game rules are simple: answer a question correctly and get the points. Wrong answers get a zero. The winning team is the first to get 8 points in each of the four categories. The students almost always want to play until the end of the 50 minute period. 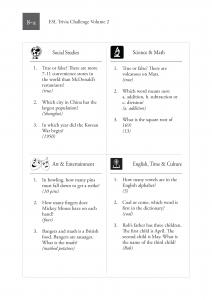 Below are four sets of question sheets, two from Volume 1 (a little easy) and 2 from Volume 2 ( a little but harder, but not much). I use these questions with university level students, but they also work well with advanced students in elementary, middle and high school. Featured image by Cubmundo. Its use complies with the owner’s creative commons licensing terms.